I wake up around four am. It's dark. I didn't get sick last night. Thank God! I feel fine this morning, except that I am really gassy. Nasty smelly gassy. Yikes, I better get up, I don't want this stuff seeping into my sleeping bag. Eeeeew. Horrible! I am trying to eat. Oof, I do my best to ignore the horrible smell in my tent. I eat my normal breakfast and make coffee. That makes me happy. I am up and walking down the road long before sunrise. I walk out of the camp and up the road to the rim of Crater Lake. ‘Four miles’ the sign says, four miles to the park headquarters where I'll need to turn right. Up the hill, way up. Not as steep as a trail though. No rocks to turn my feet either. I'm walking on the left side of the road ‘against traffic’ except there is no traffic this early. I hit a long straight section, I think I see someone else walking way up ahead. I catch up to another Thru-hiker in the four miles it takes to get to the turn. We chat a little. “What's your name?” I ask. “Nobody.” Ok, so I'm walking with Nobody. I start thinking of all kinds of things I could say. Like, “I wasn't walking alone, I was walking with Nobody.” Abbott and Costello where are you? In another few miles I come to the waterfall that Devilfish told me about last night. I drink a liter and save three quarters of a liter in my bottle. That gives me a liter and three quarters for walking. The road climbs an incredibly long way. Up, up, and more up. In a car it would go fast. Walking it seems like forever. Devilfish drives up beside me and slows down. “Do you need anything?” “Maybe some water in a couple of hours.” “Ok,” then he speeds off on the first shuttle run of the day. To Yogi: To successfully convince civilians to give you food and water. I reach a turnout on the far side of Crater Lake. It's lunch time, at least for the couple I see up ahead. They have parked in the shade and pulled out their ice chests right on to the sidewalk, blocking access to anyone walking, or trying to walk down the sidewalk. (Only the turnouts have a sidewalk). Hmmm… I walk on the sidewalk for the few short feet that I can then I turn and step out into the street to walk around their picnic spread and the car. “Hi, beautiful day!” I say cheerily. The woman looks up from her mayonnaise spreading and looks and me guiltily as I walk by in the street. “So are you hiking around here?” There's not a hiking trail within five miles of ‘here’. “I'm hiking the PCT and road walking around the lake due to the fire.” “Would you like something to eat?” Score! Touchdown No Skip! I sit in the shade eating lunch with them. Yay! This is better than walking on a road by myself dodging cars! 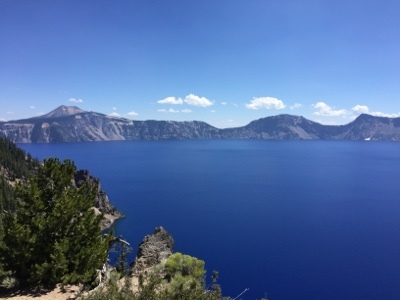 I don't understand what makes the water of Crater Lake so incredibly blue. It bores me when people feel the need to explain it. It’s surreal blue. That fake blue that kids use to color the water in a coloring book. Only vividly real and fantastically situated in the middle of impossibly steep cliffs. Inaccessible without significant effort. It seems like any trip down to the lake’s surface wouldn't end there but pass through it into the blue depths, down to who knows where. If I have to road walk anywhere, this is the place. The road meanders away from the lake on big loops around mountains that ring the lake, while on the loops I'm up, way above the forest looking down as if on a ridge. It's hard to believe I'm walking around a lake. Then the road turns back in and pokes it's head into the secret crater. There again is this magical lake glittering in the sunshine. It's surface containing a single boat puttering around its vast surface providing tours to any brave soul willing to hike a steep two and a half mile dusty trail walk do to the landing. There's money involved too, though for me it's the hike down that makes it a non-event for me. I'm not adding almost five strenuous miles to my already long day. Hours and hours later I make it around to North Junction. The place where the east rim road and the closed west rim road meet. This is also where the closed Rim trail leaves the rim of the lake and heads back to the PCT. The end of road walking and back to the trail. I meet Anthony sitting on a bluff overlooking the lake. The last view before heading down and away. I'm out of water. We chat and stare into that unreal blueness. “I'm going to head down to the parking lot and see if I can yogi some water,” I say. Down I head. “Smile, pretend like you're having fun,” I think. I smile. I reach the lot as a guy is pulling in. He rolls down his window, “You need a ride?” He asks. Hitchhiking is illegal in National Parks so getting a ride can sometimes be difficult. “No, I'm thru-hiking the PCT, do you know if there’s a water faucet around here?” I ask him. “Do you need water? I've got water.” Score! After drinking a liter and filling my bottle I head down the three mile trail to the PCT. I am exhausted, looking forward to stopping and getting off my feet. They feel like someone's been hammering on them with a meat tenderizer all day, fillet of sole anyone? As I reach the PCT trailhead and the first water cache in twenty five miles, the park ranger pulls up and swaps out ‘Trail Closed’ signs for ‘Entering Bybee Fire Zone’ signs. The PCT is officially reopened. I am not bothered in the least. My PCT took me on a path that most PCT Thru-hikers will never experience. It's a reminder to me of how different this journey is for each individual thru-hiker. We all end up having unique ‘custom-made’ paths tailored no two being exactly alike, sorta like life itself, isn't it. I eat my last remaining snacks for the day. A couple of handle fills of my favorite trail mix. My own concoction of cashews, almonds, pistachios, regular and almond M&Ms and raisins. An increase in available energy powers me down the PCT and into the flat lodgepole forest. There are potential campsites everywhere and I settle on one far enough from the trail they I won't see or hear anyone walking by. I feel so alone. Well, I am alone. I set up camp in isolation from other human beings Anthony is out here too somewhere in front of me probably. There are a few hikers that were able to shuttle around, the vast majority though are somewhere else. Unlike last night where I camped in a forest filled with people, tonight it's just me and the trees. Every night I push the ‘OK’ button on my Spot GPS Messenger. I have it set to send Kelli a text message when I push that button. I get a warm connected feeling knowing that at that moment she's getting a message from me, my way of saying, “I love you” to someone who cares about me, even though it only consists of a link to a map that shows her exactly where I am. I feel warm and loved. I crawl into my tent in this wonderful forest under the stars. Happy to be alive and happy to be past the fire and the road walking. On the north side of an unknown that has become a know part of my journey. Coyotes yip and yap somewhere off in the east as I drift off to sleep dreaming happy dreams of home.